winning more clients • “reading” people more quickly and accurately • deriving more satisfaction from personal and family relationships • closing more sales • earning more than you ever dreamed. And, perhaps most important, hearing that magic word “YES!” more often. So whether you’re selling a product, an idea, a plan, or yourself, Persuasion IQ gives you the know-how, the tools, and the confidence to succeed — every time! "A terrific read and a sure-fire way to improve and enhance your powers of persuasion. This easy-to-read book reveals how you can change minds, influence others, and reach your ultimate goals!" — Larry King, Host of CNN''s Larry King Live! "As an entrepreneur my business relies on the skills learned from Kurt Mortensen in his bestselling book, Maximum Influence. 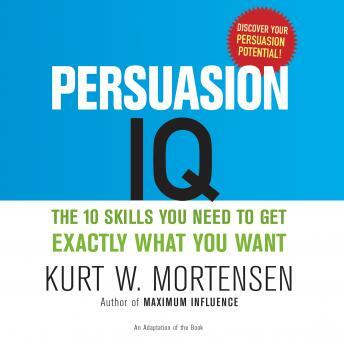 In his new book, Persuasion IQ, Kurt has hit another grand slam! His ''10 obstacles that limit your persuasion success'' alone will be invaluable to your personal and business success." — G. William Barnett II, author of the bestselling Are You Dumb Enough To Be Rich? The worksheets and graphics found in the print and ebook editions of this book have been adapted for audio.